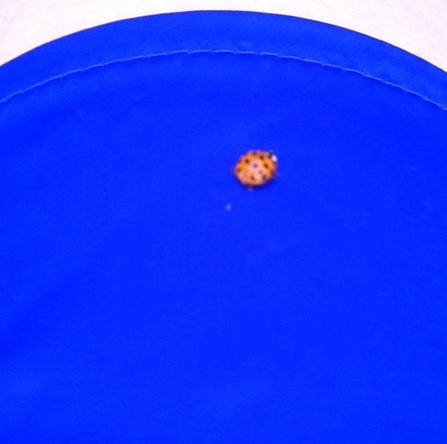 About a mile into my morning run yesterday, I stopped to wait for a car to pass at an intersection and noticed this little guy (or lady) hanging out on my running shorts. You can imagine my surprise when I arrived home four MILES later, to find him still clinging to the bright blue cotton. I can only guess what that ride must have been like for him. At times the wind was almost too hard for me to run into; it had to seem like a tornado to that little guy. Not to mention that each time I took a step my shorts would fly into the air and land back on my leg, an earthquake to the tiny bug. Yet, no matter what it looked or felt like from his perspective, in reality, I was the one doing most of the work. I haven’t researched ladybugs much (and don’t intend to) but I’m guessing that a 4 mile journey might take them a little longer than it did me. In the midst of that journey I did most of the work, his only job was to hold on. This all, of course, makes me think of the hard times we face as humans. At times, the circumstances around us are of earthshaking proportions and we find ourselves asking, “WHERE ARE YOU, GOD?! ?” And he says, “I’m right here, doing all the hard work, taking the brunt of the situation.” One mile for me is like a million for God. I move a tiny rock while God moves mountains. My only job is to hold on. In the midst of the wind and the rain and the situations that shake us to the core, we must just hold on, trusting that God’s got it planned out. We don’t even have to know which way to go, because He knows the path and exactly where He’s taking us. From our limited perspective the journey seems as if it will never end and may not make sense, but we don’t have to “figure it out”, we’re just called to cling to our God who’s running the race for us. It’s upon returning home that this analogy breaks down a bit. You see, at the end of my run, I got a glass of cool water and took a refreshing shower. At the end of God’s race was a sponge of vinegar, 3 nails, and a cross. Those last moments didn’t just involve sweat, they were so intense that He sweat blood. As we cling to Him and He brings us to that cross, He doesn’t ask us to then keep going with him, he says, “Fly free, my beautiful creation” as he steps up and takes the punishment that we deserve. He did all of that so that some day, when He’s run with us through our time on earth He can invite us into His Home, offer us the most glorious refreshing glass of living water, and say, “Well done, good and faithful servant… Come and share your master’s happiness!” (Mt 25:21). Hold on to His love. Grasp desperately for His grace.